Locally Owned & Operated by AAA Organizing, LLC as an authorized franchisee of Major Organizers. Melanie Woods owns the Major Organizers® franchise that serves Columbus, Ohio and surrounding areas. She was born and raised in central Ohio, which is where she met her high school sweetheart, Bill. Melanie and Bill have now been married 22 years and have a 10-year-old son, Aaron, and an 8-year-old son, Conor. She has a Bachelor’s of Science Degree in Nursing from Chamberlain College of Nursing, is an Oncology-Certified Nurse, and is also certified in Case Management. Though she loved being a nurse, she felt as if she wasn’t fulfilling her family’s needs and, as a result, her own happiness suffered. After seeing an episode of Shark Tank, Melanie knew that she had found a kindred spirit in Angela Cody-Rouget and decided it was time to make a leap of faith to pursue her own organizing business. As someone who had always organized and enjoyed the process and results, it seemed like an obvious transition. Buying the Major Organizers franchise allowed Melanie to own a business in a field she loved and better manage her destiny. Bill and Melanie are proud to be Veteran-owned and continue to support veterans through volunteering, donating, and offering discounts. Bill is a veteran of the Army and National Guard, where he served as a Medic. Melanie’s dad is a Vietnam veteran who served in the Army and her grandfather was a Marine who served in the Korean War. Melanie is a member of the National Association of Professional Organizers (NAPO), NAPO-Ohio, and Faithful Organizers. She is excited to be a part of Major Organizers and looks forward to expanding her team to help achieve our mission of raising up an army of Liberators to restore order to the world, one household at a time! 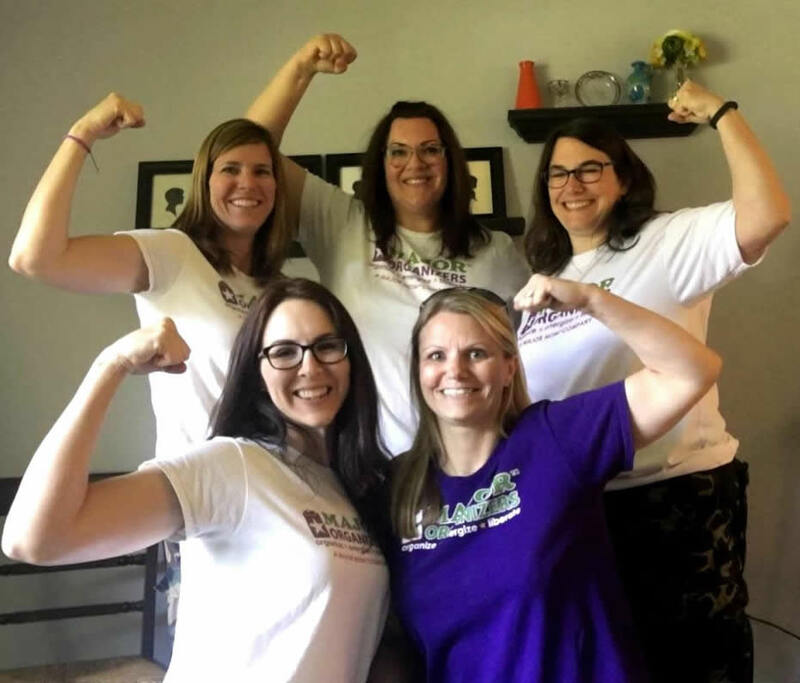 These Liberators serve Columbus Metro and are women of mass organization; they have each completed the Major Mom Academy and, after 100 hours of training, are Certified Liberators. These Liberators all have families and each has a heart for organizing busy moms and their families. Stacey has an innate love for organizing. Prior to starting training, she was a senior lab technician and enjoys spending time with her husband and kids. They raise chickens and have recently added a puppy to the family. Stacey earned her Bachelor’s Degree in Geological Sciences from The Ohio State University. When Suzanne isn’t liberating households, she loves spending time with her family. She and her husband have a daughter and son that keep them on their toes. In addition, she is involved in ministry work and enjoys singing. Suzanne earned her Bachelor’s degree in Human Development and Family Studies from The Ohio State University and worked outside the home as a medical billing specialist for approximately 15 years prior to joining Major Organizers. Like many Liberators, Tanya enjoys organizing so much, that she saw an opportunity to help others with her gift when she discovered Major Organizers. She is a clinical dietitian by trade and enjoys a flexible schedule at the hospital so she can also take part in the many activities and sports in which her 2 daughters participate. Tanya earned her Bachelor’s Degree in Dietetics and Community Nutrition from Ohio University. Andrea was the first Liberator to join Melanie when Major Organizers opened in Columbus. Andrea has such a love for organizing that she excitedly came on board so she could liberate Central Ohio households from clutter and chaos. She has many years of restaurant management experience and has also worked as a mortgage loan officer. Andrea and her husband are fortunate enough to have family close, but their dog gets most of their attention now that her step-son is on his own! Saffron was born to organize and “walks her talk”. Saffron spent her adolescence in Canada and then moved to Asia when her parents became missionaries. As an adult, she moved to America, where she started her family and home-schooled her four children. In all the places she has lived, she has always enjoyed helping friends and family members bring peace and order to their homes, kids, or schedules.She has a knack for minimizing; all of those moves sure taught her how to minimize well! Margie has always loved organizing and finally transformed her zeal into a career after she and her husband downsized from a large home in the country to a small condo in downtown Columbus. Margie received her bachelor’s degree in Archaeology from Ohio University and worked as a Substitute Teacher for many years, while dedicating herself to home and family. Now that her son is grown, she is refocusing on her passion and enjoys making organizing fun for everyone. My help with downsizing and moving into the Powell Senior Living Community has been very pleasant and it has given me a new security in enjoying my life here in my new home. Major Organizers has made this possible for me when I needed their valuable assistance. They were responsible, respectful, and organized. They taught me new ways to use my existing belongings, where to store them efficiently, or donate them to benefit others. Major Organizers arranged a referral for selling some items using a local auctioneer. They took charge, with my direction, and organized my kitchen cupboards, linen closet, and clothing, so that I could use my walk-in closet more efficiently. Thank you so much for coming yesterday to speak to our group. I heard many positive comments afterwards. Hope you get a client or two from your presentation. Have to say I am motivated (at least a bit!) to tackle the basement storage room clutter — would make a good project for the cold winter. Thanks for letting me know the winners below — although I was truly hoping it would be me! That storage room needs all the help it can get! Back in the summer, you answered my plea for a speaker and I hit the jackpot with you guys. Many thanks for your expertise. These women are hard workers and get things done. They are so polite and are non-judgmental. This was a great and stress-free experience. Andrea Limes and Suzanne came to my condo today and literally gave me a new lease on life after my downsizing move. They are strong, amazing women, moving furniture, carrying items up and down stairs, organizing, helping place area rugs, unpacking items and putting them away. They are more than worth every penny—they are worth their weight in gold. Friendly and efficient. I can hardly wait for their next visit! I am Tooting the horn for Melanie Woods of Major Organizers for doing an amazing unpack job for my dear 85-year-old client who moved out to Ohio and had nobody to help him. I was stressed out with worry about how he was going to get situated in his new assisted living apartment with no family to help and his lack of physically being able to do it himself. Even though it was a bit of travel for Melanie and her assistant, they agreed to help. Not only did she unpack his place in exactly the way I envisioned everything, but she even brought bins to help corral his stuff in the bathroom. I was kicking myself for not asking her to add labels to all of his cabinets to remind him where things are and where to return them but she had made a master list telling him where everything was in the apartment. I can’t tell you how relieved I was that she thought to do that! She also sent me two detailed emails with pictures of his apartment and an update about my client’s state by end of the day. I know my client very well and knew there was potential for some head-butting but Melanie handled everything beautifully and now I can rest easy knowing he is completely unpacked in a safe place!!! I just can’t thank Melanie enough for the relief she provided to me and for her amazing professionalism with my client. I am so grateful to have NAPO as a network of resources for my clients, I would have been very uncomfortable calling up any other organizer who was not a NAPO member to handle this client. I would not have been able to be comfortable in ~2 days~ without Andrea. She helped me throughout several phases – from start to finish. A valuable team leader and partner. Unbelievable transformation! It was a physical, emotional and mental situation that I didn’t realize until after I was done! I feel better, much better, lighter! I donated many clothes that I didn’t know I had. My bedroom is so organized now along with my pantry and kitchen! Thank you Melanie AND your girls! It was so good to work with all of you! The playroom is awesome! My girls just love it and spend so much time in there now. They watch far less TV because of it, too! Thank you for all of your help! Dear Major Organizers, I want to thank my wonderful organizer, Andrea, for her service today. I was amazed and very pleased with her work. What she was able to do in my office, in the short amount of time she worked with me, was great! I do feel liberated! Thanks again. My basement looked like I collected everything and literally just threw it down there. I had a path to my washer and dryer and hardly any rest of the floor showed. I now have a folding table, my floor is visible, and everything is put on shelves and labeled! Their organizers sorted and labeled everything and put in select areas, so I have my seasonal items in one area, my wash items in another, hardware and paint in another, etc. My office / craft room was littered with paper and boxes needing to be sorted and filed. I had let a year-and-a-half worth of stuff pile up and not filed it. I hated going in there. Andrea and Stacey helped for half a day and it is so organized. I know right where everything is. I like going in there now. It is easy to keep neat and I am encouraged to keep it that way. The girls were friendly, courteous, efficient, and fun! A few pieces of my good clothes accidentally got in the ‘donate’ bag and Andrea knocked herself out to go to the Drop-Off location and go through many bags to find my clothes and return them within three days. I was so grateful as they were items I enjoyed very much. Good job, Andrea! It was an Unbelievable Transformation! The girls were great, worked well together. Amazing results I can now function in my house and finish everything on time. I know where everything is. I can’t thank you enough. It was expensive but well worth it, as I could not have done it by myself. The Liberators arrived exactly at their starting time and worked straight through the session with no stopping. I was amazed that they could successfully sort my “stuff” so well and leave it so easy to find everything when finished. It is inspiring. It makes us want to “keep” going where they left off and move right through the rest of the house….and garage. They undid years of clutter in just 3 1/2 hours in my Utility Room, Kitchen cabinets, and Pantry shelves. It was so helpful to get their help knowing “where to start”. They listened well and worked exactly to our wishes. I had been nervous that my husband would be upset, because he is so sentimental about letting go of things. They were so respectful and did not force anything upon us that we didn’t already know should be done. I highly recommend their professionalism and character. Many thanks. This was a Herculean Effort! Major Organizers is one of the best companies I have ever worked with – I was overwhelmed and needed to sell my house. Liberators came in and helped me with my garage and basement. It was just what I needed to motivate the rest of my family to get busy and be productive. The hours I had left on my package were used to set-up cabinets in my new sewing room. The most compassionate and caring people ever!! Suzanne did a fabulous job; she is so professional, but personable and totally trustworthy. Excellent workers! Patient and flexible. I love my new space and I expect to hire them again in the future. ANDREA and SUZANNE were awesome! Thanks Ladies!!! Magic….it was an unbelievable transformation! The ladies have a gift to make life organized & uplifting!! Great ladies. Definitely will rehire for next spring clearing. These ladies were incredibly hard working, professional, and fun. We spent the weekend together and I never once felt pushed into doing anything I didn’t feel comfortable with. Honestly, it felt like i had invited a couple of friends to help me. They had wonderful ideas to share and even spent time looking up different items I could purchase that would help keep things organized. It has been 4 months since I was “liberated” and things have stayed organized for the most part. Great team. Thank you! My husband and I were downsizing from a very large home to a much smaller one. Everything that didn’t fit into the smaller house ended up in the garage. After several months of trying to make ways to empty the many boxes and make space, I just couldn’t motivate myself to even go into the garage. Calling Melanie with Major Organizers was the best thing I have done in years. She came out and created a plan of action. Melanie was truly amazing and her storage ideas helped me keep some of the items I truly wanted to keep but just couldn’t find the room or space for. Melanie was great to work with. She was kind, motivating and her organizational skills were excellent. Having Melanie not only provided me with my garage being used for our cars (instead of boxes), more so she gave me peace of mind. I am so happy I called Major Organizers and am grateful for Melanie and her expertise. I can truly say this was the best thing I have done for myself in years. THANK YOU MAJOR ORGANIZERS. Melanie did an awesome job in helping me organize my bedroom closet. When she came into my house, we sat down and discussed why she decided to make a career change and how excited she is in her decision. When we began the task of removing everything from my closet and used her organizational skills on replacing my clothing, shoes and miscellaneous items back into my closet I was amazed with the fact that we not only fit the clothes I originally had in there but also additional clothes from a closet from another bedroom. When we started the process I couldn’t walk into my closet because of all the shoes on the floor. We sorted through my shoes and made decisions on what to keep, throw out, share with others and to donate. (We did the same with my clothes). Melanie is very efficient in her organizational skills and very passionate in what she’s doing. She was very focused on the task she was there to accomplish.